MCM’s metal parts are the die-casting products made of zinc-aluminum alloy, using the technique of die casting molding. Under the consideration about the economical efficiency of products and the fine production features of metal parts, using this material will shorten the metal processing time and is capable of mass production. What’s more, this kind of manufacturing method can improve the productivity, stabilize the quality, and also, lower the quantity of defective products. The metal parts are able to meet all manufacturing requirements from mold design, precision die-casting mold, CNC machining, drill and tappling, polishing and sandblasting, anodic treatment, to paint coating. 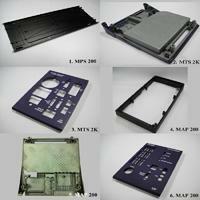 Besides, our products are corrosion resistant, conforming to the environmental regulation of RoHS directive. For 40 years experiences in this industry, our metal parts can be applied to various kinds of products include automobile, electronics, electric machinery, pneumatic tool, motor, and aerospace. Nowadays, our major markets and cooperate customers are Taiwan, China and Europesuch as France, German. Please feel free and contact us for more information today!